MGA has a long history of commissioning test facilities for its various test locations as well as customers. These facilities are primarily related to full vehicle crash or accelerator sled systems. MGA relies on decades of experience in running similar facilities whenever new facilities are designed for customers. MGA will work with customers to develop a facility that is flexible, well thought-out, and meets the technical requirements specified. After a facility is installed, in-depth training will be conducted by MGA engineers who have years of testing experience. MGA’s Strong Floor approach is a universal system which can be used for many types of laboratory environments. The design includes a floor-level T-slotted section which can be adjusted in terms of the slot width, depth, and spacing. 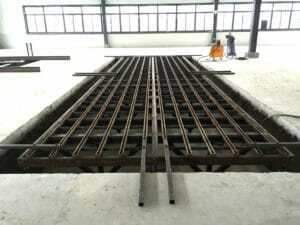 The floor is anchored with a structural steel insert and a steel rebar grid. This system can be used as a bedplate replacement for many types of safety, durability, or other test applications. The floor can be tailored in size to fit various dimensional foot-prints. This approach is also ideal for the development of large-scale laboratories in which large areas of T-slotted flooring is desired. When laboratories are developed from the ground up or utilizing an existing building, MGA’s strong floor system is often an excellent choice early in the design process. This system has been used at many of MGA’s internal laboratories and has functioned well for many years. See Strong Floor Facility Base in our catalog. MGA’s Accelerator Sleds have supported a variety of industries throughout the world for over 20 years. With systems installed in facilities ranging from automotive OEMs to child restraint manufacturers, our facilities have produced repeatable results that aid in product development. Not only do we design these systems but 12 of our sled systems are being used at MGA facilities every day. With this comes the ability to layout optimized lab space to maximize efficiency. Our experience with these systems, along with our expertise in design, results in our customers having the best installation, training, and system dependability for this certified test facility. See Accelerator Sled Facility in our catalog. Designed and built with the direct input of MGA’s Crashworthiness Team, our crash test facilities are created with high-efficiency operation in mind. MGA’s Vehicle Crash Facility customers are trained not only in the use of their new equipment, but also in the proper setup and completion of current and future vehicle crash test modes. The design of MGA’s tow and guidance system ensures years of low maintenance operation. Innovative features can also be designed into the crash facility. These features result in much greater overall crash capability and test efficiency. See Vehicle Crash Facility in our catalog. MGA Research Corporation’s Battery Test Facility was designed to specifically address the safety, confidentiality and test methodology concerns related to testing of Lithium Ion batteries. This facility provides our customers with the ability to run known test specifications, or to modify test protocols to fit your individual needs. The advancement of battery technology has resulted in changing capabilities for the test laboratory. MGA’s Battery Facility offerings are designed to be flexible from the standpoint that experimental test protocols can be executed. 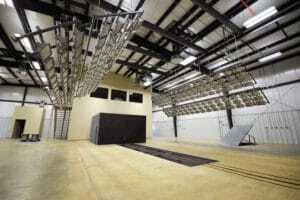 See Battery Test Facility in our catalog.